It's also mesmerizing to watch your hair wrap itself around the device. Having already worked on 1,600 kilometers worth of real human hair, Dyson obviously wasn't going to stop at its Supersonic hair dryer. In fact, the engineers have found a new purpose for the Supersonic's V9 digital motor. 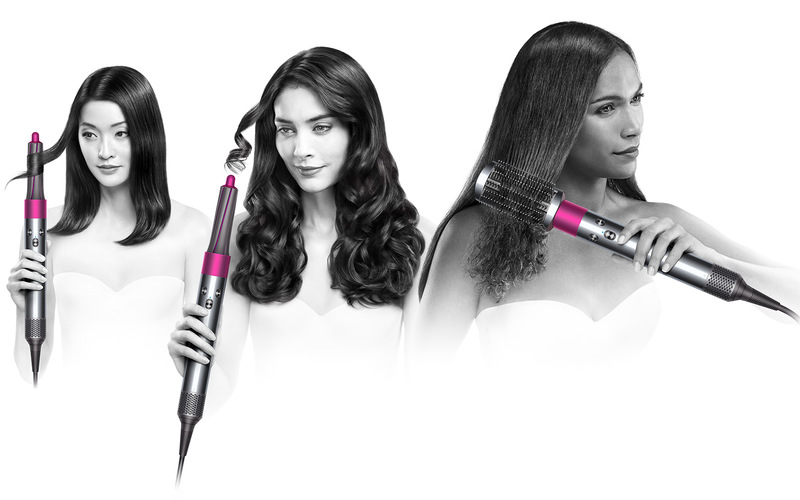 Announced in New York today, this rod-shaped Dyson Airwrap is positioned as an advanced curler that can also straighten or dry your hair, depending on which one-click attachment you put on. It's also fun to use, as you can watch your hair magically wrap itself around the curling barrel. What you see here is a phenomenon called the "Coandă effect." Basically, each slit along the barrels create a jet of air flow that largely stick to the attachment's surface due to difference in pressure. By having multiple slits, this creates a continuous air flow running around the barrels, which is why they are able to gently pull hair towards them like a magnet. Then simply pull the Airwrap away and you have yourself some curly hair. Dyson claims that you also won't have to worry about tangling problems, which is a big advantage over conventional curlers. Another plus is that the Airwrap operates on temperatures no higher than 150°C/302°F, whereas traditional curlers go up to the 200-250°C / 392-482°F range which isn't as healthy nor safe for the hair (think hair burning off when it gets trapped or tangled). And of course, you're also less likely to hurt yourself should you accidentally touch the attachment, as confirmed by our Shanghai colleague who got to watch the Airwrap in action. Another pain point with conventional hair curlers is that they require totally dry hair, but the Airwrap can work on hair that's 90-percent dry. If your hair isn't quite there yet, simply pop on the pre-styling dryer nozzle -- it looks like the top part of a Dyson desktop fan, but miniaturized -- for some quick blowdrying. Obviously, if you're fresh out of the shower, then Dyson would want you to use the more powerful Supersonic instead. For straightening, there are three comb attachments designed for specific types of hair -- some harder (especially in Asia), some softer (mostly in the West). The soft smoothing brush with ball-tipped bristles is designed to add body and volume to fine, flat hair while creating a smooth, blow dry finish. The firm smoothing brush is for straightening thicker, coarser hair. Last but not least, there's a round volumizing brush for creating volume and shape on finer, thinner and straighter hair. Cross-section diagram of the Airwrap's soft smoothing brush attachment. In the US, the Dyson Airwrap is going on sale in three packages, with both the Dyson Airwrap Volume + Shape kit (for flat hair) and the Dyson Airwrap Smooth + Control kit (for "frizz prone hair") available for $500, whereas the Dyson Airwrap Complete set with all attachments is priced at $550. All three sets come with a box, meaning you can travel with this kit with ease.